Driver/guide Tony L. was very knowledgeable about the tv series, filming process, and locations as well as being skilful driving on very narrow roadways. Wonderful to visit Clogges Manor Farm, Brampton and Highclere Castle. Had 3 hours at Castle so not rushed. Lots to see there re: the beautiful castle, its estate and the museum re: Earl of Carnavons connection to discovery of King Tutankhamens burial chamber. Castles own guides very informative too. La unica sugerencia es que podrian armarla para gente de habla hispana. Por lo demas fue muy bien llevada a cabo. This tour was absolutely fantastic. Our guide was wonderful and we went to filming locations as well as the castle. It was a perfect day in the beautiful English countryside. This tour did not disappoint. Tony was an excellent guide and had lots of good information to share, and our driver, Daniel, was timely and efficient. I highly recommend a small group tour instead of a big bus tour to see Highclere Castle and the other sights. The crowds were relatively small the day of our tour so I really got to see everything I wanted to see without having to wait or stand in line. 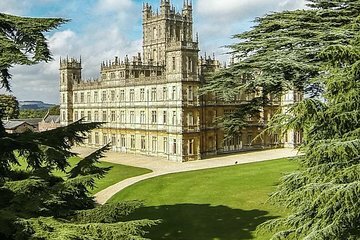 A thoroughly enjoyable tour with a well-informed, experienced guide and driver who took us first through the Cotswolds, stopping at the farmhouse used in filming as well as the village of Bampton Downton Abbey village before getting to Highclere Castle. It was raining most of the day nevertheless, we had a very interesting tour of the house and grounds and time for tea. Having followed the Downton Abbey series, it felt like being at home. Highly recommended. I had a wonderful time with a small group. Our guide was very informative and funny. The driver was most accomplished. Our tour guide, Debra, really made the trip. She is full of life and very knowledgeable. If at all possible I advise the small group tour as you can go places the big bus can not get to. Andrew was an outstanding guide - very knowledgeable about everything Downton, as well as British history and geography. He made the tour fun and very interesting.